I’ve suggested this to many clients in an effort to reduce their collections, but we never seem to get there. I was so excited to finally make one, especially for my own daughter. I must say, it was an awesome process! I can now refer Campus Quilt with confidence and personal experience. I have had clients do this in the past and they were never disappointed! Glad you were able to enjoy the process as well as the final project. it looks great! I have many clients who have made tee shirt quilts. What a gift of love! What a beautiful way to keep the memories and remove the tshirt clutter. One of my clients had a similar issue recently with her daughter’s tshirt collection. We talked about the quilt idea, but instead setttled on a tshirt book (in the interest of space and use.) We took photos of all the tshirts, she turned it easlily into a photo book (using Shutterfly or another vendor,) and was able to donate the all boxes and boxes of shirts. A win win all around. I love this idea. I have often thought of turning some of my sons cherished baby outfits into pillows. I love these creative ideas for repurposing memories. I make these as well (although I’m not sure mine are quite as nice!) Great use of the old t-shirts. 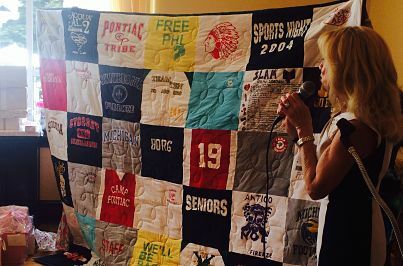 I sent both of my girls off to college with a t-shirt quilt. I use fleece on the back and in between shirts as a border, so they are super cozy. Everyone can use another blanket!